ceda are delighted to be sponsoring the chef jackets for the Association of Catering Excellence (ACE) Ready Steady Cook competition on 20th September. 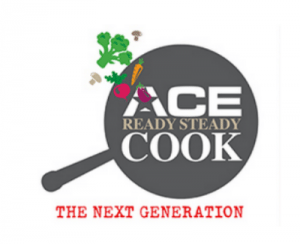 Different in nature to other chef competitions, ACE Ready Steady Cook is a competitive and fun event where the audience can network and be a part of the evening. With ACE’s focus firmly on encouraging and recognising young talent, each team of two chefs will include one under 25 years old. With a huge LED screen above the competitors cooking area, the teams can be closely followed through the two heats and supporters can get close to the action! It all takes place in an impressive open-plan venue, The East Wintergarden, Canary Wharf which is easy to get to by tube or car, with parking close by. There will be a ‘Street Food’ area, together with sponsor and supplier stands, providing opportunities to mingle, chat and try samples. It’s great fun, attended by over 200 food service guests and 14 competing teams. A video of last year’s competition can be viewed here: www.acegb.org/readysteadycook.php.